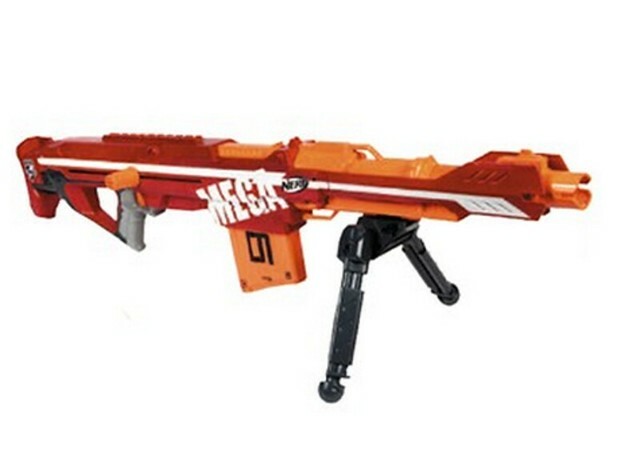 Shops.ch add Elite Mega Centurion & Vortex Revonix360 listings, products descriptions. Revonix360 to fire 3 disks? The French site Shops.ch once again has give the NIC a bit of a sneak peek more at the upcoming N-Strike Elite Mega Centurion and Vortex Revonix360 blasters. Here’s the original text, and translations for each item. Soundmedia.ch also put up a listing for the Mega Centurion. That’s where I got the image from in this post and simply re sized it to about twice it’s original size. I’ll save my thoughts on this new product image for another post. As for the Revonux360, I’m a bit confused because the original product description I got makes no mention of it shooting 3 disks. Sure it was mentioned at the Toy Fair that the Revonix360 there was a proto-type, but I feel like the product would have been much more finalized before they sent out a product description of it. We’ll see what the future holds for these products. The posted up image from shops.ch, expanded to twice the original size by me. Yesterday afternoon, a Swiss German site put up a listing for the N-Strike Elite Rapidstrike CS-18. A French version of the same site added the same listing, but with a product description. Le RAPIDSTRIKE est un pistolet 100 % automatique pour des tirs en rafale : jusqu à 3,6 fléchettes par seconde. Sa batterie est allégée. Elle est 75 % moins lourde que celle du Stampede. Pour une utilisation plus personnalisée, la crosse est ajustable. Contient 18 fléchettes! or when translated through Google Translate. 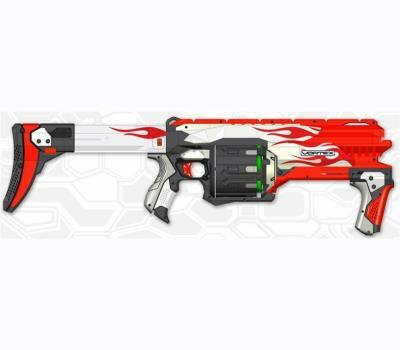 Description translated: RAPIDSTRIKE the gun is 100% automatic gunfire burst: up to 3.6 darts per second. Its battery is reduced. It is 75% lighter than the Stampede. For a more personalized, lacrosse is adjustable. Contains 18 darts! This blaster is most likely what was referred to as the rumored “new Stampede” I posted about on the blog about a week ago. As you read this post, please remember that this is all speculation based off a site listing, it’s photo, and it’s product description. 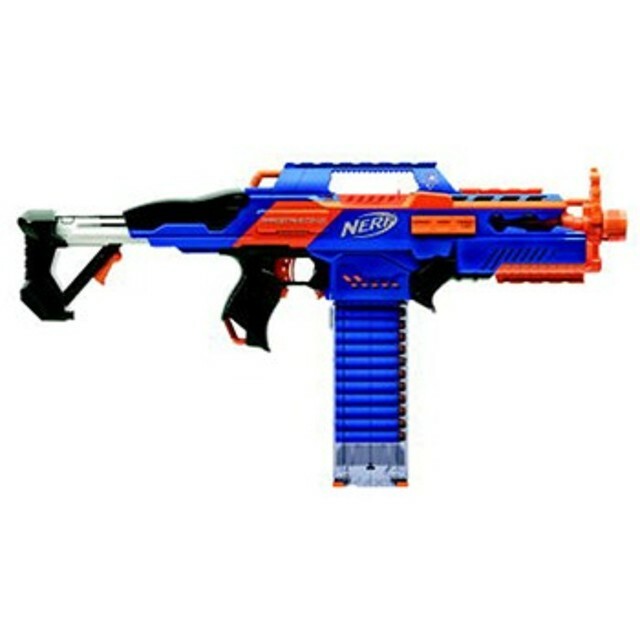 As of March 15, there’s still has been no official confirm or deny of this blaster. Just take a look at the above photo and take it all in. It’s a very awesome looking blaster to say the least. But it’s going to be a flywheel blaster, based off the comment that MyLastDart left on my blog post about the rumored Stampede. 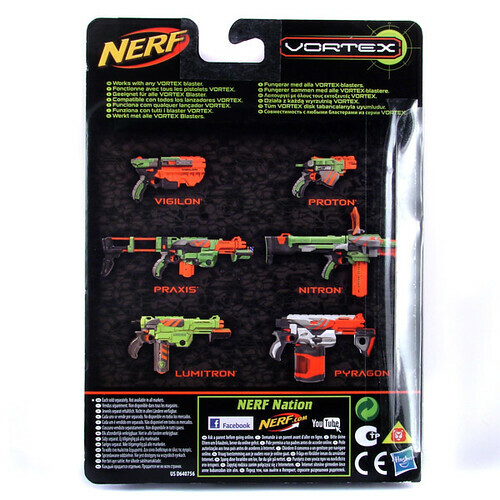 With automatic burst fire, the only other automatic flywheel blaster is the Nerf Vortex Nitron. Of course it might not be a flywheel blaster, but again I’m basing this post on what he said. I’ll talk more about the rate of fire later in the post, and compare it to other blasters later in this post. 3.6 darts per second is not a slow as you think it is. There’s a clear clip on the blaster, and the darts look different with their black tips. Is this hinting towards new kinds of darts and a new clear clip? You can also see 5 different tactical rails on the blaster. MyLastDart has hinted toward their being an under barrel attachment of sorts that’s going to be released in the future. And it looks like there’s plenty of room on this blaster for that. It also looks like there’s going to be 3 solid sling points, 4 if you count the stock area loop, on the blaster. This is very important for things like Humans vs. Zombies and indoor games. There’s ALOT of initial thoughts and speculation going around in the NIC. I’ll list and talk about things like possible pricing, release dates, stock performance, ergonomics, special features, marketing, and more after the jump. If you don’t feel like reading all the post, I’ve also made a video in which you can also listen to the things I discuss in this post. 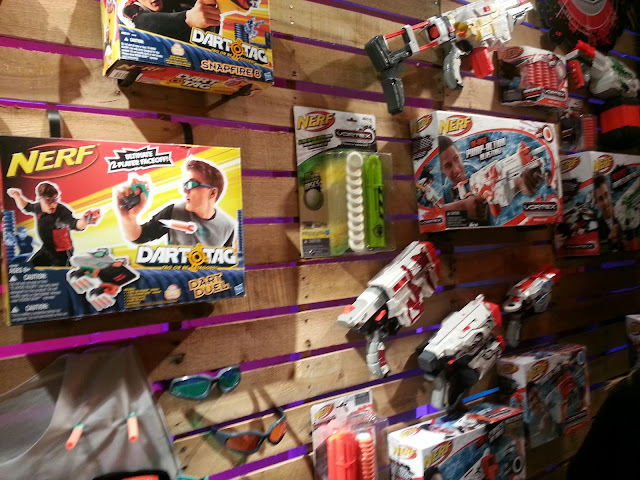 Watch the Nerf Double Your Blasting Commercial featuring the N-Strike Elite Rough Cut and the Vortex Diatron blasters. Their latest commercial finally hits Youtube. This is also the first time I’ve seen an Elite & Vortex blaster together in the same commercial. Urban Taggers got the scoop from a reader that a Hungarian website recently put up listings and photos for two colors of those upcoming newly colored XLR Discs. I was informed that they were coming coming Fall 2013, but the listing for red and the listing for blue both say that their in stock and ready to be shipped out. Looks like the Nitron with the shield is still coming as well. So remember when MyLastDart said that Nerf would release XLR Trick Shot discs? 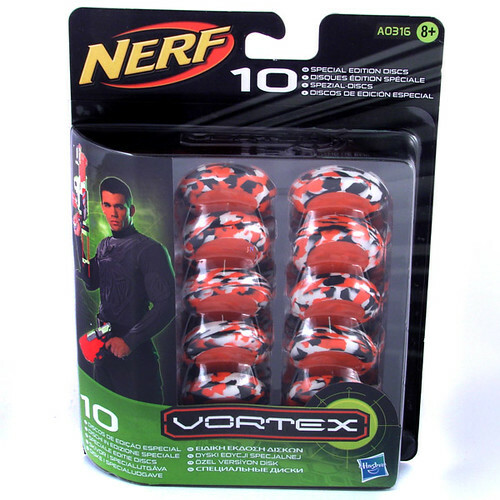 My PR contact recently contacted me and said that in Fall 2013, Nerf would be releasing different colored XLR Discs to correspond with each blaster it comes with, and not Trick Shot discs. You can see a couple of different disk colors on the Vortex box art blaster above. 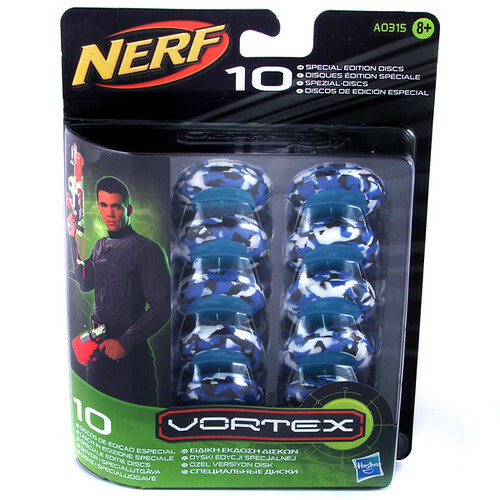 Usually Fall is the last season when Nerf releases their products. Could we see this technology that MyLastDart mentioned in the future? I guess it’s a possibility, but for 2013 I doubt it. In this new and improved episode, we discuss our new format, then go on to some recent news, followed by a short review of the Dart Tag Stingers. It’s been a bit of time since I posted an episode of the AFON show, but they released episode 30 recently. Their trying a new show format, so check out the episode if you have time, and leave them a comment on the video to let them know what you think.